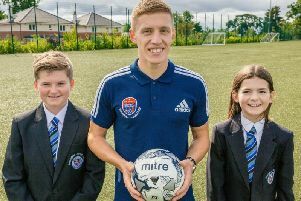 Rangers midfielder Greg Docherty has launched a football academy at his old school in Milngavie to help youngsters follow in his footsteps. The 21-year-old midfielder - currently on loan at Shrewsbury Town - was back at Douglas Academy last week to get the scheme up and running. Initially the Greg Docherty Football Academy will run for six-week pilot period on a Monday and Friday evening, beginning next week. It will be based at the school and be open to male and female players aged between 10 and 12 who are already playing football, offering training sessions and advice on nutrition and other aspects of being a professional footballer. Speaking to the Milngavie & Bearsden Herald, Greg stressed: “Between the ages of 10 and 12 is quite a crucial time, but we don’t want to step on anyone’s toes. “The idea is to give kids a bit of extra training that they might need or they might not be able. “It’s going to be proper training, it’s going to be the real deal. “We’re going to make it very professional so that kids can get the idea of what it would be like if they were to go into a professional or a pro-youth set-up. Greg will run the academy in conjunction with local coach Tommy Orismaa, but admitted that moving on loan to Shrewsbury has meant in the early stages he won’t be as ‘hands on’ as he had initially hoped. However he said: “I still plan for this to just be a temporary change for me at the moment. “Tommy coached me all through my age group, off the pitch as well. “He’s a very close family friend and advised me on so many things off the park as well as what can help me me on the pitch so I’m excited to be working together with him. “I was very fortunate. My parents were behind me but they weren’t pushy parents, they allowed me to develop at my own pace. 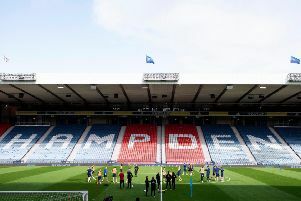 As far as his own career is concerned, Greg said that while he is enjoying hhis football at Shrewsbury, he is still determined to be a long-term success at Ibrox. He said: “It’s a season long loan and my aim is definitely to be back at Rangers. “That’s my long-term plan, I have quite a few years left on my contract so I’m fortunate in that sense and I hope to go back there more experienced and I can start adding to the team. “But I’m enjoying it at Shewsbury. It’s very fast and physical and maybe suits my game. I’m seeing a lot of the ball and being heavily involved with my team and really pushing. “I look on it as a challenge and I’m embracing it and enjoying it and I’m learning, which is the main thing.